Property Size 1,175 sq. ft.
What a view! This high rise condominium in Seascape Resort is waiting on you to enjoy! Enjoy incredible views of the gulf from the balcony, living area, kitchen and master bedroom. Relax on the private deeded beach access or at the lagoon style pool. 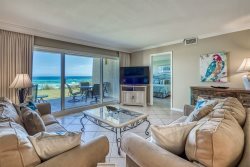 The Ariel Dunes Resort features a private, gated resort, breathtaking views of the Gulf of Mexico and Choctawhatchee Bay, a drive-through entrance, ground floor lobby, two huge pools, convenient beach access. The Seascape Resort Community features beach access 18 hole championship golf course with pro shop (discounted rates available for renters), tennis courts, pools, on-site conference center, fresh water lakes, beach service, Whales Tail Beach Bar and Grill seaside dining and live entertainment, water sports rentals as well as chairs and umbrellas. Queen sofa sleeper in Livingroom. Add $110 for housekeeping and 11% for tax. There is a $69 damage protection fee, $30 booking fee, and 2.5% to processing fee for credit card payments. A 25% deposit of the total rental amount is due at the time of booking to secure the reservation.